This is the second largest loch on Tiree situated in the north west of the island. 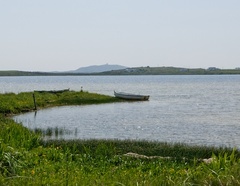 Two small islands in the loch may be crannogs. A crannog is a type of ancient loch-dwelling found throughout Scotland and Ireland dating from 5,000 years ago. Many crannogs were built out in the water as defensive homesteads and represented symbols of power and wealth. It is believed that the ‘Battle of the Sheaves’ between the men of Tiree and Norse invaders was fought just north of the loch towards the cornaigmore coast. The invaders suffered many casualties and are said never to have returned. The loch is now used for fishing and water sports.